Bartender, get me another Tarkovsky. Stronger, this time. For those of you sighing heavily, I promise I’ll get back to watching the trash Hellraiser sequels soon. 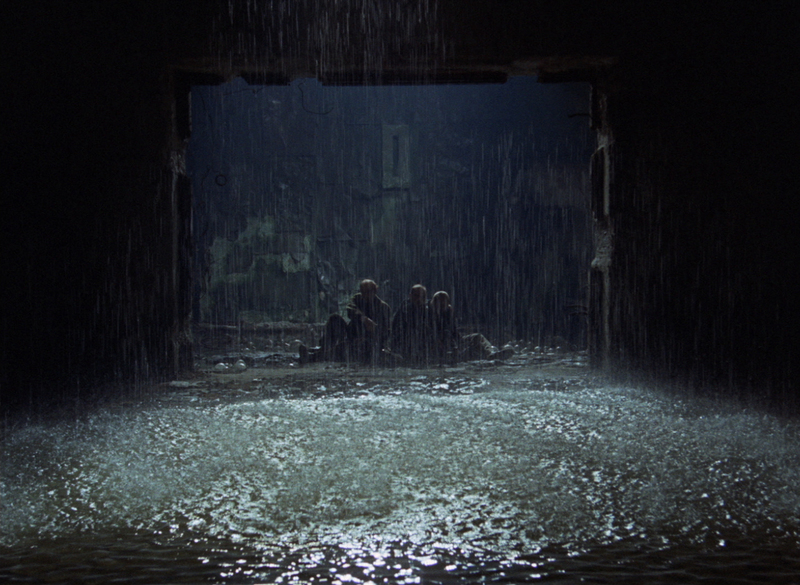 I gave my whole Tarkovsky spiel in my write up on his 1972 introspective sci-fi film, Solaris. After having missed Stalker at my local independent theater, I was disheartened that I wouldn’t get to see it, especially after one of my co-workers saw it and really enjoyed it. But alas, you can always count on the Criterion Collection to re-release old school art films for way too much money, and a couple weeks ago, they did just that. Talking about the value of films and how much they should cost is a debate for another day. Let’s just get to the Russian arthouse weirdness. Stalker takes place in a strange world. Is it post-apocalyptic? Perhaps. Nothing grows in the non-specific country in which Stalker takes place. Buildings are ruined, and the earth is cracked beneath everyone’s feet. Is it a dystopian hyper-industrial future? There’s more evidence of this, with the militaristic police that seem to be patrolling every street corner and every back alley. Chemical factories and power plants make up the skyline. Whatever the case, the world of Stalker is a funereal one. Three men meet in a bar. We do not know their names, only their professions. The Professor, the Writer, and the Stalker, a man trained to bypass the military quarantine surrounding a mysterious area of lush greenery simply known as the Zone. These men are prepared to risk their lives for their mission into the Zone, as legend has it that within the Zone lies a room that can immediately grant the wishes of anyone who enters. If I were to describe Stalker with one word, it would be: hypnotic. Much like Solaris, Stalker features rather little dialogue and often minutes-long shots. Usually the camera movement will be slow or subtle, allowing you to take every bit of visual information a scene has to offer, but occasionally you’ll get some rather striking on-screen compositions. One of the most memorable is when our trio of truth-seekers first enter the Zone. The film, which starts completely in a dirty, oppressive sepia colour pallet opens up to full colour once the Stalker leads the Writer and the Professor across the barbed wire and machine gun guarded walls. This striking change of colour comes right after a series of close-ups of each of the characters faces while they ride on a railcar, the background whizzing behind them. These handful of shots last for over three minutes. You’re given the immense scale of their journey these men are undertaking. Three minutes of dudes just sitting in a rail car is an eternity in movie-time, but Tarkovsky purposefully lets this ride out. You go from interested, to bored, to interested again, to completely engaged. You can see every nuance of these men’s faces, you’re given the time to really see the series of emotions they go through, and how different each of them feel now that their plans have become an actuality. It’s a great way to give us a ton of information about the characters without exposition. Everything you need to know is spelled right out on their faces. There isn’t even a need for world building in Stalker, as the cinematic language Tarkovsky uses right out the gate is enough to completely put you in a trance. Thing is, you have to let it. This is the kind of movie you will get with Stalker. If Solaris (I’m sorry to keep comparing the two, but they’re the only two Tarkovsky movies I’ve seen so far) would be an impossible slog for someone who thought 2001: A Space Odyssey was slow and boring, Stalker might as well be Hell on Earth for them. But not this Hell on Earth. If they hate Stalker, they might like that one. Stalker is an art movie through and through. I’ve got to cough up the same shtick from my Solaris review: I totally understand why somebody would not like Stalker. Stalker can be dreadfully boring to somebody who isn’t in the right mindset when they hit play, and if you’re not completely open to whatever the film has to throw at you (or rather that nothing gets thrown your way), you could shut it out completely, dismiss it as pretentious bunk and never ever think to watch it again. But it is a rewarding movie for those who seek capital A art. Not only is it beautiful looking, it manages to tackle themes as deep as any art flick before it, but manages to keep it grounded. Forget Solaris’ existential dread of whether or not the memories of a person are the person. Solaris offers interesting questions for you to ponder over cheap scotch with your other weird artsy friends, but Stalker asks questions that pretty much anyone can relate to. Moreover, how should I know, how should I call that… what I want? And how should I know that I do not want that what I want? Or, let’s say, that I actually do not want that what I do not want? It’s all these empirical things: if you name them, their meaning disappears, melts, vaporizes… like a jellyfish in the sun. Have you ever seen that? My consciousness desires the victory of vegetarianism in the whole world, but my unconsciousness dreams about a piece of juicy meat. And what do I want? Stalker lets you ponder questions like that well after it’s final shot. I don’t even think it offers an opinion on the matter, either. There’s no right or wrong answer to the conundrums this film seems to kick up, but again, this is art in the form of a movie. It’s not supposed to answer anything, it’s just meant to get you to start thinking about it and help you understand yourself. I think that is the ultimate strength of Stalker and why it seems to endure as one of the most lauded films ever created. Sure, it’s beautifully shot and very well acted. The locations and sets are completely breathtaking and it’s a masterpiece of cinema on a technical level, but at the end of the week, Stalker will have occupied way more of your time than the two hours and forty minutes it was flashing across your screen.